Because we fabricate each product in-house, you can be sure of obtaining cupboards to the exact size and specification you require. What’s more, because we use only the highest-quality, 304 food-grade metal (316-grade in laboratories), your storage units will last for decades, making them the cost-effective choice for your project. From a hygiene perspective, our food-grade steel is perfect for catering and healthcare environments. Made from 60% recycled materials, and fully recyclable at the end of its long life span, it is also the environmentally-friendly option. Whether you are looking for storage to slot into an existing scheme, or need to furnish an entire room, our skilled engineers can fabricate everything, from a single cupboard to a fully integrated storage system, complete with open or closed shelving, stainless steel worktops, trolleys, tables, drawers and sinks. Our laboratory cabinets are made from the highest quality, 316-grade steel – which will resist acid, intense heat and radiation. Thanks to its inbuilt antibacterial properties, it is also ideal for a sterile environment. The sheer durability of our metal means your cupboards will last for decades. We can fabricate cabinets to any size and specification, from tall cupboards for maximum enclosed storage to small units to slot beneath worktops. Because every piece is made onsite by our skilled engineers, the options are almost limitless, from the style of handle to the addition of worktops, built-in sink units, height-adjustable legs – or even castors, for added convenience. We can include shelving in a variety of widths and depths, hinged or sliding doors, and a secure plinth to prevent items from rolling beneath the unit. Despite this flexibility in our approach, we always meet deadlines – so that you can be sure of keeping to your schedule. Thanks to more than half a century’s experience of fabricating stainless-steel products for laboratories – from school labs to hi-tech spaces for universities and industries – we understand that each environment is unique. Take a look at our range of fume cupboard liners, sinks (with or without drainers, and with or without overflows), shower trays, vanity tops, splashbacks, security plinths, shelving, trolleys and frames, all of which are fully customisable to your requirements. 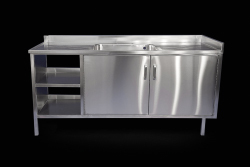 Our cabinets are made from the highest-quality, ‘304’ food-grade stainless steel, which has proven antibacterial properties, which in combination with an ease of cleaning and maintenance ensure the lowest risk of the spread of bacteria. We pride ourselves on the longevity of our products – which outlast products manufactured in all other materials, even Trespa, making it the cost-effective long-term choice. Resistant to chemicals, heat and impact, your cupboards will still be standing strong decades from now. Each piece is made onsite, to order, in our factory by our skilled engineers, meaning our fabrication process is highly adaptable: you can order the exact size of unit you require to fit your healthcare centre, clinic or hospital space, with almost limitless customisation options, from different widths and depths of shelving, to sliding or hinged doors, a choice of handles, a built-in work surface or integrated sink, and height-adjustable or wheeled legs. All doors and drawers can be supplied with security locks. We match our attention to detail with more than half a century’s experience and a dedication to timeframes: we will always meet our agreed delivery schedule. Our expertise extends far beyond our bespoke cupboard range: take a look at our sinks (including plaster sinks and slop hoppers), frames, trolleys, tables, plinths, shower trays, splashbacks and worktops, all of which can be customised to your designs. Our stainless-steel cabinets are the perfect choice for educational establishments, as they are vandal- and impact-resistant and highly durable – they will last for decades and withstand the wear and tear of such demanding environments, making them the most cost-effective long-term choice. We use only the highest-quality, ‘304’ food-grade steel, which is also hygienic and easy to maintain. Our expertise doesn’t stop there – take a look at our range of bespoke products, including shower trays, trolleys, tables and vanity tops, all of which can be customised. If you require something you don’t see here, just give us a call – we will do our utmost to fabricate it for you. At DSM, we understand the demands of a busy catering environment. That’s why our cupboards are made from top-quality ‘304’ food-grade stainless steel which will last for decades, resisting the repeated impact and heat of a commercial kitchen. Hot pans from the oven or hob can be placed straight on to the steel surface, without causing staining or damage, and the naturally antibacterial surface can be easily wiped clean. From an environmental perspective, our steel is an excellent choice: it is made from 60% recycled materials and the end product is fully recyclable. Thanks to our bespoke factory set-up, we can also offer any number of steel worktops, trolleys, tables, splashbacks, extractor canopies and sink/drainer combinations – Get in touch today, to discuss your requirements. A high-usage area such as a washroom needs heavy-duty furniture. That’s why all our cupboards are made from high-quality, ‘304’-grade stainless steel, which will last for decades, making it the cost-effective option. We can also supply: shower trays, vanity tops, splashbacks, wash troughs, urinals, slop hoppers and many other products. If you require something that’s not shown on our site, let us know: we will do our best to fabricate it for you. With their gleaming surface, our cupboards will bring a luxurious, modern finish to your contemporary kitchen or bathroom. Line them up in a row to create a reflective ‘wall’ of light and drama; or dot them around the room, to provide a series of focal points: storage never looked so sleek and glamorous. Thanks to their neutral shade, our steel cabinets will complement any style of kitchen and bathroom furniture and fittings, from high-gloss laminate to granite and oak; or use them as a foil to a vibrant modern colour scheme, such as burnt-saffron or lime-green. The high-grade metal we use boasts natural rust-resistance, which, combined with inbuilt antibacterial properties, makes our cupboards a perfect addition to a kitchen or bathroom, where hygiene is essential. Thanks to our bespoke production base, you can choose from an almost limitless range of options, from differing heights and widths of cupboard to added splashbacks, built-in sinks and integrated worktops. We also offer all depths and widths of shelving and drawers. We supply our cabinets with clever, height-adjustable legs as standard – or you can choose to have castors fitted, to create a movable work surface. If you have small children, we can fit locks to the doors and drawers, to keep little fingers safe and to keep cleaning products secure. We use only the highest-quality, food-grade steel, which comprises 60% recycled materials – and the end product is fully recyclable, so you can rest assured that your choice of cupboard has minimal environmental impact. The entire cupboard is made from this steel, making it incredibly strong. What’s more, we offer a twenty-five-year guarantee* on all our products, so you can be sure your storage unit will last for as long as you need it. Where space is limited, our sliding cupboard doors are the ideal option, while a taller storage unit makes great use of space in a room with a high ceiling. 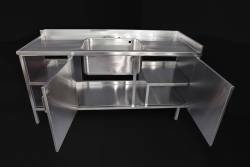 We also fabricate entire kitchens – check out our range of worktops, sinks, trolleys and tables. A shower tray is another great choice for an up-to-the-minute home; again, this can be fabricated to the exact size and shape you require. At DSM, we have more than half a century’s experience of supplying products to the healthcare industry, including veterinary surgeries. Our ‘304’ food-grade steel boasts inbuilt antibacterial properties, which keep bacterial build-up to a minimum, making it the ideal choice for your veterinary surgery. It is also of such high standard and durability, it will last for decades, making it more cost-effective than other options, such as Trespa. We understand that each veterinary practice has different requirements, and many may need to cater for a wide range of patients, from rodents to reptiles and large animals. Because all of our products are made onsite by our skilled engineers, we can fabricate the exact storage unit you require for your practice. 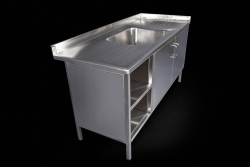 Whether you need a built-under plinth to prevent the ingress of small animals; a splashback to protect walls; castors to create a mobile storage unit – especially useful for a surgery; lockable doors and drawers to keep medication safe; open shelving; an integrated worktop, or a built-in sink, we can supply it. We can also produce cupboards to any width and length, so you can be sure of achieving a precise fit for your space. We also offer a wide range of other products. Check out our sinks, shower trays, wash troughs, consulting tables and vanity tops. Thanks to our bespoke production base, we can also fabricate products that do not appear on our website. Get in touch today, to discuss your requirements.